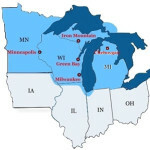 LTL of Wisconsin service areas below. LTL delivery shipments typically weigh between 151 and 20,000 lb (68 and 9,072 kg). Our LTL carriers use “hub and spoke” operations where small local terminals and larger more central terminals are the hubs (also called Distribution Centers or DC’s). Spoke terminals collect local freight from various shippers and consolidate that freight onto enclosed trailers for transporting to the delivering or hub terminal where the freight will be further sorted and consolidated for additional transporting (also known as linehauling). In most cases, the end of line terminals employ local drivers who start the day by loading up their trailers and heading out to make deliveries first. Then when the trailer is empty they begin making pickups and return to the terminal for sorting and delivery next day.